I first made this cherry, prune, and almond granola in January as a way to use up leftover Christmas prunes. It was so deliciously chunky, chewy, and sweet, that I have made it several times since. Enjoy it for breakfast with low-fat or skim milk or sprinkled on top of your favorite yogurt or cottage cheese. For your Mother's Day, breakfast, let your guests decide how they'd like to enjoy it. Pour the granola is a pretty bowl with a serving spoon and have milk, yogurt, and cottage cheese available for them to choose. Tart cherries and sweet prunes compliment each other beautifully in this granola, though feel free to make your own substitutions based on what's in your cupboard. Some other tasty combinations include: cherries and dates, cranberries and prunes, and cherries and apricots. Just about any kind of nut from walnuts to pecans work well. Just don't skip the vanilla and spices, which add subtle flavor and enticing aroma. Preheat oven to 300 degrees F. Combine first 5 ingredients in a medium bowl. In a small pan over medium heat, melt honey and butter. Remove from heat; stir in vanilla, salt, cinnamon, and nutmeg. Pour honey-butter mixture over the oat mixture and stir until well coated. Spread out mixture on a large rimmed baking sheet coated with cooking spray. Bake for 10-15 minutes, stirring once or twice, or until granola is golden brown. Cool completely. Love the mix of ingredients and flavors...very nourishing. Great idea for Mother's Day breakfast. I love granola! This one looks fantastic! A great mix of ingredients! Another lovely idea for Mother's Day. S, you have an excellent taste in choosing/combining different ingredients. Same (or more) impressed me, your artistic sense in photography! Luuuve this foto. Yum that granola looks so tasty! I love that the recipe doesn't contain any oil. Thanks for another great recipe! I have my own version of granola and make it all the time. I vary it according to what I have on hand, but it has never dawned on me to use prunes. I've used every other type of dried fruit, wonder why I never thought of prunes as it's an obviously good choice. Wow, thanks for the inspiration, Susan! I just love this food blogging community! You learn something new every day. This looks delicious! And I love the tart sweetness the prunes and cherries add. I'm a granola fanatic and have even been known to give packages of it as hostess gifts. Never, ever worked with a prune before. :) They must be nice and sweet against the tart cherries. juliana-I'm so glad you like it. thanks! rosa-Me too. It's one of my favorites. paula-Yeah, I don't really like oil, and I find the butter sub works just as well as the real thing w/o the added fat and calories. kate-Me too. It's a great pick-me-up at around 3:00 pm with some coffee. patricia-They are precious, aren't they? duodishes-I hope you give them a try. They are so moist, sweet, and chewy and provide the perfect contrast to the tart cherries. Great combination! I love homemade granola, and this recipe looks delicious. Your granola looks fabulous! A great treat for Mother's Day or any day. Thanks so much for the link! Its been quite a while since I have had the time to blog hop so I've missed out on a lot here. 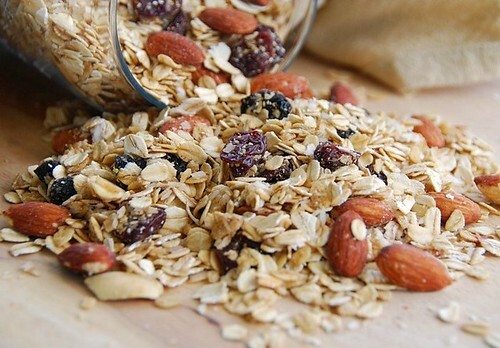 But this picture of your granola caught my eye. Looks so beautiful, Susan. I've made granola few times since 'discovering' it last year - and will be bookmarking your prune and almond version, for sure!! I just love your yummie granola!